Whether your existing pool is outdated or in need of repairs, the pool remodel is the perfect option to transform your current pool into a stylish and modernized backyard oasis. Combining creativity with state-of-the-art updates can help provide a more attractive property but also enhance the comfort and safety you and your family. Not to mention, renovations can also help you save time and money. Over time your pool’s finish can become chipped or appear worn and once this happens, it also can be both a safety hazard and drain on the pool’s energy use. Consider repairing or replacing your pool’s surface for a fresh, updated look. You can opt to refinish with poured concrete, tile or an aggregate finish for a durable and attractive look. If your patio or decking material is damaged, this can not only be unsightly but present safety hazards to your swimmers. Additionally, damaged pool coping can lead to water loss. Consider remodeling your patio or decking with a safe and strong material like concrete, natural stone, flagstone, bricks or pavers. We’ve got plenty of options to fit your sense of design! With newer cutting-edge technology on the market, now is the perfect time to maximize your pool’s efficiency and safety features. For example, you can install an energy-efficient pool filter or pump to reduce energy bills or swap out your lighting system for a LED, mobile capable system to not only make your pool more attractive but to increase visibility. These are just a few examples of the possibilities that exist when it comes to updated or renovating your existing pool. 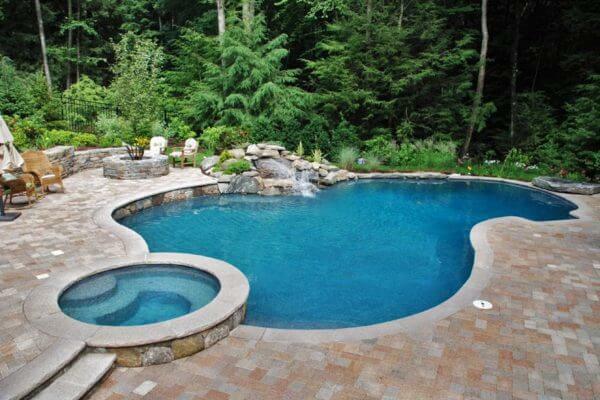 Get in touch today as our team is ready to help you bring your pool dreams to fruition!